On the very first cold January morning of this year, I woke up, stretched, and as my eyes fluttered open, I realised that I didn’t want to be the reason animals suffered anymore. Well, maybe it didn’t happen exactly like that. I did decide that as of the new year I wanted to become a fully fledged vegan, but it was by no means an overnight decision. On the contrary, transforming from omnivore to 100% vegan in twenty four hours required plenty of preparation. But I did it, and after six months of living without any animal products, I can confidently say I will never turn back. So let’s get down to how I did it, and how you can do it, too. I consider this first step on my vegan journey to be 100% the most crucial. Being secure in why I wanted to go vegan is what made it so simple to give up the lifestyle I’ve had for the past twenty one years of my life. But, before we get into my personal reasons for going vegan, here is what I consider to be some of the main reasons that fuel other people to ditch animal products. If you had to go out and slaughter an animal yourself in order to eat meat, would you? Could you walk up to a cow and kill it? A pig? If your answer is no, you should be vegan. Morally, it’s that simple. Answering no means that on some level, you don’t agree with the killing of sentient beings for food. If you had no real problem with it, you’d be able to do it yourself. But killing the animal isn’t the be-all and end-all. Some may argue that vegetarianism is ‘enough’ because they aren’t eating the animals, but the dairy industry is just as cruel as the meat industry when it comes to the mistreatment of animals, if not even more so. To produce milk, cows are forcefully impregnated, only to have their calves ripped away from them immediately after birth to be sent to slaughter and sold as veal, or to repeat the nauseating cycle if the calf happens to be female. When chickens are bred to lay eggs, the male chicks that hatch and have no use in the egg industry are literally ground up alive, and the females that are left spend their short lives in cramped, filthy cages. If your reason for giving up meat is a moral one, vegetarianism is not enough. I’ve spoken to people before who have said that if they were forced to see what really goes on behind abattoir doors, they wouldn’t be able to eat meat anymore. Perhaps this is the case for you. If you do feel this way, I urge you to consider watching one of the dozens of documentaries that have been made about the animal industry, some of which are even available on Netflix. Not all are overly graphic, but they are all extremely informative, and can provide you with much more eye-opening information than I have on this blog post. But back to the point at hand. Veganism is not just a moral issue, and it’s super important to remember the other benefits of giving up animal products. As well as saving animals, a vegan diet has been proven to benefit our health in various ways. Eating more fresh fruit, veg, whole grains, nuts, and soy products can help prevent multiple diseases including type 2 diabetes, numerous cancers, and osteoporosis, not to mention improving skin, hair, and nail quality. Many women who have switched to a plant based diet have reported a decrease in PMS symptoms, and it is important to note that it can greatly help manage symptoms of PCOS, a condition that affects around 1 in 5 women in the UK. By cutting out meat and dairy, you immediately eliminate the risk of contracting diseases like E. coli, salmonella, and mad cow disease, which are contracted by eating contaminated or raw meat and eggs. You won’t be consuming the additional hormones that animals in the meat industry are pumped full of to speed up their growth, and instead you’ll increase your intake of fibre, antioxidants and vitamins. If you do decide to switch to veganism, a question you’ll probably be asked at least once is: but where do you get your protein? Hearing this question is not as annoying as the fact that there are literally so many ways of getting a healthy intake of protein without eating meat, that the question shouldn’t need to be asked in the first place. Take a look at this little protein chart from Simple Happy Kitchen. Look at their adorable little faces. Ironically, you can eat any of the above totally guilt-free because unlike the millions of animals sent to slaughter for meat everyday, these protein sources don’t have adorable little faces in real life. So, we’ve established that it is absolutely possible to thrive on a completely plant based diet, but don’t just take my word for it; Mike Tyson, MMA and UFC competitor Mac Danzig, and Carl Lewis are just some of the famous athletes who now follow a vegan lifestyle. Sports Illustrated’s ‘Olympian of the Century’, Carl Lewis, famously claimed that his best year of track competition was the first year he ate a vegan diet. If that’s not enough to convince you, I don’t know what is. There’s another reason to favour a vegan diet that I find is spoken about far less than the two I’ve just mentioned, which is strange as it’s one that affects not just us, or the animals, but everyone on the entire planet. It may be difficult to picture how changing your diet could impact the planet, but veganism has numerous environmental benefits on top of the health and ethical advantages I’ve previously mentioned. For example, an estimated 700 million tons of food that could be used to combat world hunger is currently fed to land animals that are bred solely for meat. There are millions of people who are deprived of fresh water, yet livestock consume vast amounts, as well as being one of the world’s biggest polluters of water. It is said that producing a pound of beef requires 100-200 times the amount of water that is needed to grow a pound of plant foods. Raising livestock is also a leading cause of deforestation; around 70% of forests in the Amazon have been destroyed to make room for grazing. This, in turn, erodes and weakens the soil, as the trees that are removed once provided valuable nutrients and resilience to the earth. If the livestock occupying that land was instead replaced with a diverse selection of plants, it would lead to increasing the long term resilience and nourishment of the soil. If we look at energy consumption and air quality, eating a vegan diet has a far lesser negative impact than eating meat. When you consider the process of raising livestock; the great amounts of food they consume, the delivery of the animals to the slaughterhouse, and the delivery and refrigeration of meat products, you are looking at 8 times the energy costs that would be required to grow plant products. 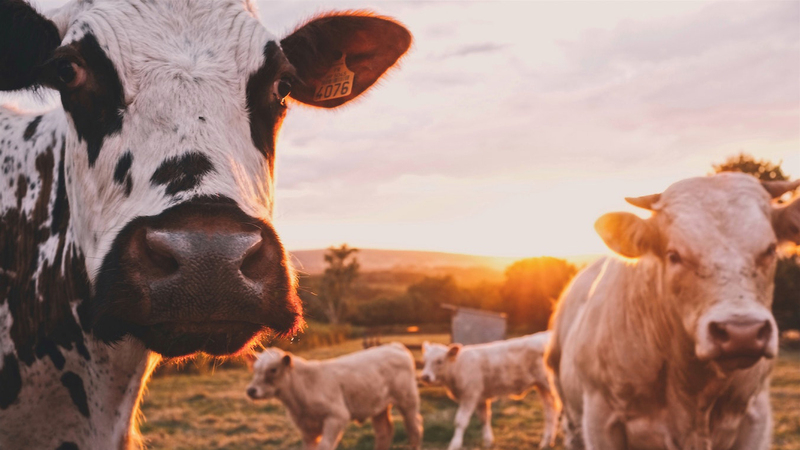 Animal agriculture causes greater air pollution than all modes of transportation in the world combined, estimated at 14.5% by The United Nations Food and Agriculture Organization. For those of us who are conscious of being more environmentally friendly in our day-to-day lives, going vegan is one of the easiest ways to reduce your carbon footprint. So, before you embark on your vegan journey, I think it’s absolutely essential to determine why. For me, it is a combination of the above that lead me to veganism, but the moral side of it is definitely what fuels me most. In my opinion, if you consider veganism as mainly a moral issue, it makes it a thousand times easier to adopt the lifestyle. I’ve been asked in the past how I’ve managed to ‘stick’ to veganism, but it was never a challenge for me once I changed my way of thinking. I will never want to kill an animal. It is not the same as craving something naughty when you’re trying to stick to a diet; it is something that I now consider a way of life. Whether it is the moral, health or environmental benefits that encourage you to adopt veganism, there are still reasons beyond the ones that I’ve mentioned here that you can look into yourself to help you make a decision, which leads me nicely to the second step of my process. If you’ve decided you want to be vegan, and you’ve determined why, congratulations! You’re one considerable step closer to making a positive difference to the welfare of animals, your health, and the environment. If you, like me, are transforming from someone who was fully a meat-eater to being totally vegan overnight, you might be anticipating that it is going to be considerably harder for you to make the transition than it was for someone who was already vegetarian. I am inclined to disagree; I found that such a drastic change was actually easier than just giving up a few dairy products because it forced me to completely reshape my way of life, and the way I looked at food and cooking. But, everyone is different. Consider the transition as a journey, even if you are ‘making the switch’ in a short time frame. Some days will be easy, some days might be a little harder. You will probably make some mistakes, and that’s okay. What can make it easier to avoid making mistakes is doing some research. Fortunately for us newbies, it has literally never been easier to be vegan. This means there are so many resources available online that are totally free and just a click away. There are helpful tips, beautiful recipes and even reviews on vegan restaurants and products that will all help make your transition to veganism that little bit easier. For those of you that prefer watching videos to reading, there are loads of vegan vloggers sharing tons of useful information on YouTube right now. There are just as many written blogs, if you’d rather have a quiet read over watching videos. Pinterest is a great tool for making boards full of recipe ideas, and is also where I tend to find most of my nutritional infographics which make it super easy to keep track of all the good stuff I’m eating. If you prefer to have printed material to refer back to when it comes to recipes, relevant news, product and restaurant recommendations, and top tips, there are also a variety of vegan magazines currently available across the country. These magazines have become one of my most valued resources, not only for recipes but for an all-round hub of useful information that you might have to search for a little longer to find when browsing the web. Similarly, if cookbooks are your thing, there are honestly so many out there that you’ll have your bookshelves filled in no time. I would definitely recommended spending a weekend or two having a look into the different aspects of veganism that will apply to you. If you have little to no knowledge of vegan alternatives to your favourite non-vegan foods, have a Google. I can guarantee that by now there is a vegan replacement for almost everything. If there are certain cuisines that you prefer over others, try and find recipe books that cater to a style that you’ll enjoy. Remember; veganism shouldn’t just be a ‘diet’; you’re supposed to enjoy it. If you do veganism correctly, you won’t feel like you’re missing out at all. Once you’re a little clued up on vegan food, products and recipes you’d like to try, it’s time to sit down and prepare for that dreaded first vegan food shop. Depending on your circumstances, this step might need to be adjusted to suit your budget and living situation. When I became vegan, I lived alone. I only had to shop for myself, and that made my situation considerably easier than someone who maybe lives with a partner or their parents, or doesn’t have full control over shopping money or the actual practice of going food shopping. However, there’s absolutely nothing to say it isn’t possible; you will simply have to adapt this step to work for you. So, first things first; what should you buy? I separate my shopping list into two basic categories: fridge and cupboard. These categories are hopefully self-explanatory, but you can easily split these down into further categories if you want to be super-duper organised and if it would make things easier for you. Whilst there will be certain things on your shopping list that you may have never purchased before, there will likely be certain staples that you already have or happen to buy regularly. I’m by no means the ideal vegan, so if you want to see what other vegans pose as their perfect shopping list, there are so many examples online that you can simply take your pick, or combine them into one mega list. You simply have to work around your budget. I’m not made of money, so I often start by listing my essentials. For the fridge: non-dairy milk (I buy soya), mushrooms, spinach, peppers, broccoli, carrots, celery, courgettes, cucumber, and fresh tomatoes. For the cupboard: oats, pasta, spaghetti, rice, bread, potatoes, onions, garlic, tinned chickpeas, tinned tomatoes, tinned coconut milk, and peanut butter. When I say essential, this is pretty much as basic as it gets, minus a couple of those vegetable variants if money is super tight. Consider it the ‘last week before payday’ shopping list. Note how I haven’t listed any fresh fruit as an essential; this really should be an essential, but sometimes my budget simply hasn’t allowed for it, bringing me to the ‘luxuries’ for both categories. Some of these you might scoff at as they aren’t really luxuries at all, but I call them that because I’ve had to cope without them in the past and have still been able to produce decent meals in their absence. For the fridge: tofu, fresh fruit juice, strawberries, raspberries, blueberries, oranges, bananas, mangoes, fresh pineapple, asparagus, aubergine, fresh ginger, and non-dairy yoghurt. For the cupboard: vital wheat gluten, silken tofu, nutritional yeast, quinoa, sun dried tomatoes, dairy-free pesto, sweet potatoes, kidney beans and black beans. I also haven’t included any seasonings or sauces; it is preferable to have a broad selection of herbs and spices for cooking, but the exact ones you’ll need depend largely on the type of food you like to cook. And I think it’s fair to assume you will probably have at least some seasonings before you go for your first vegan shop. If you don’t, you should get on that, pronto! Variety is the spice of life, as they say. If you do your research, you’ll probably find some vegan shopping lists are either completely different to mine, or are far more extensive. This is the same as non-vegan shopping lists; everyone will have certain things that they buy often and frequently cook with, and lists will always differ from person to person. Consider what you normally buy already, and work on replacing the non-vegan items with vegan alternatives, and expanding on the vegan things you already purchase, like vegetables, with ones you might not have thought to buy before. I truly believe that veganism isn’t all fruit and veg, and it is entirely possible to have a beautiful variety of produce at home if you know what you’re looking for. The next question is: where is best to shop? Again, this largely depends on your budget and what is convenient to you. Most, if not all major supermarkets will at the very least have a free-from aisle where you can find a lot of vegan alternatives to your usual non-vegan products. When it comes to the basics, like fruit, veg, and pastas, you can shop pretty much anywhere and find similar standards of produce. For items like this, I usually try and shop wherever is cheapest; this is usually somewhere like Lidl or Aldi. If you can afford to, shopping locally is always the best option because it helps support local businesses, something that massively helps support your community. Step 4 somewhat coincides with step 3 in the sense that, what you’ll be adding to your shopping list will depend on what you decide to eat during the following week. This may not apply to all of your cupboard items, which are simply good to have in the house, but for your fresh stuff it’s important to plan ahead to ensure all the delicious fresh produce you buy doesn’t go out of date before you have a chance to use it. Similarly, what I said about how step 3 might need to be adapted depending on your situation also applies to meal planning. If you don’t live alone, or if you don’t usually cook dinner, try to have a conversation with those that you live with about your dietary requirements and come to an understanding about how you want to conduct your meal-eating from now on. Meal planning is useful no matter what, but it is especially helpful to a new vegan. If you have never tried cooking vegan meals before, it can often seem like the easiest option for cooking dinners would be to prepare the meals you are used to, and simply remove any animal products. I would advise against this if you intend on actually enjoying what you eat. Vegan food should never feel like a meal without the ‘good stuff’, which is what some of us might be used to when we order a non-vegan restaurant’s only vegan option. Instead, consider your vegan meals as something entirely different. They are full of goodness, and should not need to rely on one or two ingredients to make the meal enjoyable, as is often the case with non-vegan meals. If you did your research properly, you should by now have a decent library of potential vegan meals that you’re interested in trying. Plan something for breakfast, lunch, and dinner over the next week, and then note down all the ingredients you’ll need to purchase at your next shop. If you’re new to meal planning, you may find that this will leave you with a shopping list that’s miles long; this is why I often try to plan meals that use a similar range of ingredients, with perhaps only a few being specific to each meal. For breakfast, I often alternate between one or two different meals throughout the week; whether it be overnight oats or a bowl of fresh fruit. We usually try to make enough dinner to take leftovers to work for lunch the next day, and this means that dinners themselves are often the only specific meals I need to worry too much about. Meal planning might seem like a bit of a chore at first, but if you’re new to vegan cooking then it is one of the best ways to make the transition easier. This final step was the most therapeutic for me, although it was a little labour intensive compared the previous four. One of the most rewarding parts of transitioning to veganism is the opportunity to cleanse your cupboards of all animal products, ready to make room for all the lovely, cruelty-free deliciousness that you’ll purchase at your first shop. Obviously, if you don’t live alone then you can’t exactly clear the kitchen of products that other people will use, so instead, discuss with those you live with if it would be possible to have your own designated cupboard space or shelf in the fridge reserved especially for your vegan products. Although I would strongly suggest you shouldn’t keep anything non-vegan just because you’ve already bought it, I would also encourage you not to let it be wasted. Food, whether it was produced unethically or not, is still food; and whilst we may wish everyone we know would change to veganism, it won’t happen overnight for everyone. In the mean time, try to donate any dried or tinned goods to charity, and give anything that can’t be donated, such as fresh produce, to friends and family. Getting rid of everything non-vegan in your kitchen might seem a bit daunting, especially if it leaves your cupboards rather bare, but I can’t stress how useful it is to start your vegan life on a fresh slate. Removing any non-vegan products from your life removes the non-vegan option from your life, meaning the only way is up (and vegan!). So, you’ve made it this far. You’ve decided why you want to be vegan, done your research, planned your meals for your first week and wrote a shopping list, and cleared your cupboards of any non-vegan nastiness. Now, all that’s left to do is to restock your kitchen with brand new vegan produce, and begin the exciting adventure of your vegan journey. For me, my first six months as a vegan have been a breeze. I’ve tasted things I’ve never had the opportunity to try before, learnt more about my environment than I have for years, and have been able to enjoy a conscience totally clear of guilt from harming beautiful living creatures. As Gary L. Francione said: ‘Veganism is not a sacrifice. It is a joy.’ and I couldn’t agree more. If you have any questions or useful tips that I haven’t included in this post, feel free to leave a comment. Let’s chat veganism!